One brave warrior, touched by the gods, must overcome all odds to save mankind from a merciless andpowerful tyrant. Directed by visionary filmmaker Tarsem Singh (The Cell, The Fall) and written by Charles Parlapanides and Vlas Parlapanides, the home entertainment release is chock-full of must-see bonus features including an alternate beginning, two alternate endings, deleted scenes and an amazing graphic novel, creating the ultimate viewing experience. 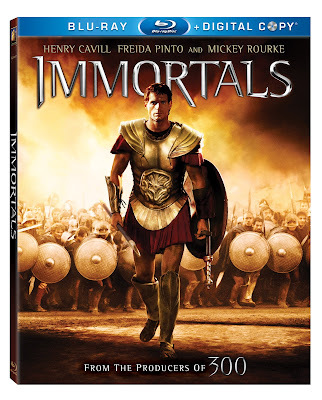 From the producers of 300, Mark Canton, Gianni Nunnari, and Relativity’s CEO Ryan Kavanaugh, IMMORTALS explodes off the screen with action-packed battles, mythological adventure and an all-star cast including: Henry Cavill (Superman: Man of Steel), Luke Evans (Robin Hood), Kellan Lutz (Twilight), Isabel Lucas (Transformers: Revenge of the Fallen), Freida Pinto (Slumdog Millionaire), Stephen Dorff (Public Enemies), John Hurt (Hellboy) and Mickey Rourke (Iron Man 2). In this epic tale of vengeance and destiny, power-mad King Hyperion (Rourke) threatens to destroy all of humanity on his maniacal quest to obtain the ultimate weapon – the legendary Epirus Bow that gives the power to unleash war on both Heaven and Earth. But Theseus (Cavill), a heroic young villager chosen by the gods, rises up to stop Hyperion’s brutal rampage. With supernatural help from the beautiful oracle Phaedra (Pinto), Theseus embraces his destiny and leads a fierce band of warriors in a desperate fight for the future of mankind. We're not much of an action type movie buffs, we're more into comedies, but when we do watch an action film we pick ones that we have high hopes for and hope to not get let down, Immortals did not fail us. I thought the beginning was a bit slow as you are listening to the narrator explain to you what's going on, but once you actually get to the point of where the story begins, the movie goes by pretty fast. This is not a movie for children at all, there's a lot of blood and tons of killing going on, we kind of expected this since we were big fans of the movie 300. So if you plan on watching this and have little ones, make sure they're not around for this movie. One of the features on this blu-ray I thought was great was that you get an alternate beginning and two alternate endings for this movie, which we thought was awesome. We decided to go with the regular version, but after we were done with the movie we went back to see both alternate beginning and ending of the movie and although they were great, we were glad we went with the regular version of this movie. I loved the ending to this movie, how there "could," be another one if they really wanted to create one, but movies like these are better left alone to be a classic. IMMORTALS is now available on Blu-ray and DVD. Disclosure: All opinions are my own. I received Immortals at no cost for the purpose of this review. No other compensation was received.